The MPC has lost the plot again . . . The Monetary Policy Committee (MPC) appears to have lost the plot. It seems to have given up on targeting inflation. The likelihood is that, because of the committee's lack of action, the UK economy may well experience a bout of deflation that will be hard for the economy to recover from. This is a very big worry. Its job is to target the CPI in the medium term. Specifically it is supposed to aim to get the CPI back to target two years ahead. Its normal policy trigger is to adjust interest rates up or down. Interest rates are at 0.5 per cent now and can't really go any lower. Hence, the MPC has been increasing the amount of money in existence by quantitative easing. Up to this point, it has injected just over £200bn of new money into the UK economy. Today it issued its Inflation Report with its forecast for inflation and growth. The growth forecast is much more optimistic than those of other forecasters such as the National Institute of Economic and Social Research. But the inflation forecast is more interesting. Below are two fan charts from the report which show the range of the forecast. The fan widens as time moves forward, as it is harder to forecast further into the future. For those who are technically minded, this is the 90 per cent confidence interval rather than the single line that most other forecasters produce, and suggests what the MPC sees as its range of error. The first chart (5.4) is the forecast produced today and the second (5.5) is the one produced in November 2009. It is clear that the central forecast for inflation -- the darkest part of the fans -- is lower two years out than it was in November. The vertical dotted line is the outcome that the MPC, by statute, focuses on, because its job is to target inflation a couple of years in the future. It can't do anything to influence the inflation rate next week or the week after. Changes in interest rates, and changes in quantitative easing, take some time to work through the economy. Inflation is going to jump over the next few months, primarily because of the rise in petrol prices and the increase in VAT from 15 per cent to 17.5 per cent. Indeed, the likelihood is that the committee will have to write a letter to the Chancellor, Alistair Darling, explaining why inflation is above target. They will just say: "Don't worry, it will fall back down very quickly." But the big concern is that inflation is below the target two years out, according to the MPC's forecast. 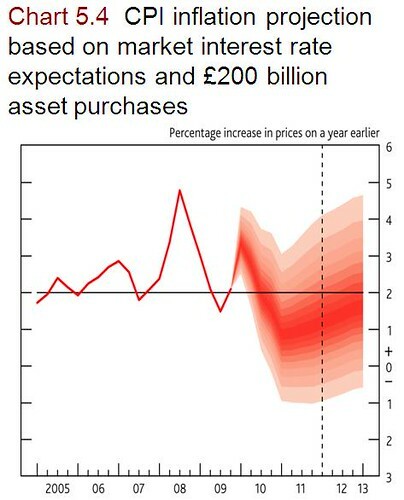 The implication of this is that the Bank of England either should have been cutting interest rates further by a lot, which it can't, or it should have been doing more quantitative easing. Another possibility is that the pound would have to fall further, which may be something the MPC is targeting. And the committee's forecast for growth is incredibly optimistic. It is much more optimistic than I think is reasonable, and also more optimistic than the recent projections from the NIESR. If output turns out to be lower than the MPC forecast, then inflation will be even lower. 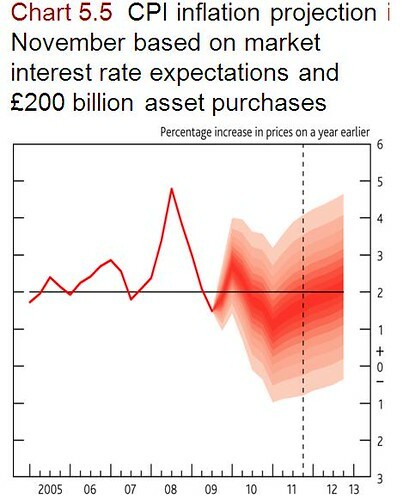 The likelihood is that before two years are up, even based on this forecast, the committee will have to write a letter to the Chancellor explaining why inflation is below the target! The MPC conditions its forecast on market interest rates, which have fallen since November, so that should imply more inflation, not less, as such a change is stimulative. The MPC doesn't forecast these rates in its report but just accepts what the markets predict they will be. Worryingly, even when the assumption is made that interest rates will remain at 0.5 per cent across the forecast horizon, inflation never hits the target. It did hit the target in November using this assumption. So the implication is that the future will be more disinflationary than the MPC thought in the past. The implication of this latest inflation forecast is that the MPC needs to put more stimulus into the market. In normal times, I would be voting for a big cut in rates, perhaps as big as 150 basis points. These days I would also be voting for lots more QE -- and sensible members of the MPC such as David Miles probably did that. An alternative would be to see the exchange rate fall in the wake of this news -- which it already has this morning -- and for gilts to rise, which they also have done this morning. It is now clear that interest rates are not going to rise any time soon, and so the expectation is that the yield curve will fall further. As each week goes by, I am becoming more and more convinced that this MPC is not fit for purpose. The Inflation Report published today was another nail in its coffin. David ("Danny") Blanchflower is Bruce V Rauner Professor of Economics at Dartmouth College, New Hampshire, and professor of economics at the University of Stirling. He is a former member of the Monetary Policy Committee. His economics column appears weekly in the New Statesman.